Guns N’ Roses frontman Axl Rose is thanking fans and his bandmates for the support following an illness that forced the rocker to perform an abbreviated show at the band’s November 25 concert in the United Arab Emirates. "They've got me on IVs and a bunch of injections, 'cause I got sick today, I've been throwing up for about the last five hours,” Rose told the crowd during the band’s performance at the Formula 1 2018 Etihad Airways Abu Dhabi Grand Prix. “So, instead of canceling, I'm gonna do the best show we can for you." “Wanna thank All the fans, the band n’ every one for their concern n’ well wishes!,” posted Rose on social media ahead of the group’s show in South Africa on November 29. “In Johannesburg w/plenty of time to be ready for the show! This flu or whatever is a wild ride! Comes in waves. You’re ok till you’re not! 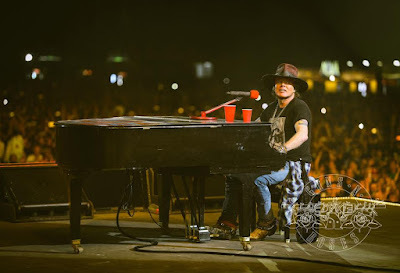 Guns N’ Roses will wrap up their 2018 live schedule in Honolulu, HI on December 8.